I spent seven years testing the F60C on various hulls before I finally got around to trying the tiller-steer version – but it was worth it because its brilliant multi-function tiller arm makes it a superb engine for open tinnies to 4.8m. The tiller arm incorporates an upfront gearshift, ignition key switch, variable trolling rpm control, warning lights for low oil pressure and engine overheat, and a trim/tilt switch that’s separate from the twist-grip throttle. This design is very important for user-friendliness because, regardless of the throttle opening, the switch stays in the same plane with the logical push down for trim-in and push up for trim-up. On a competing 60 model the tiller-mounted trim/tilt switch changes plane according to the angle of the twist-grip throttle. This means that when the throttle is opened well out, the switch function changes direction, with trim-down being up and vice versa. Understandably this can get very confusing. Another design aspect of the F60C is the relatively small gearcase. Again, the competitor’s 60 has a large gearcase with massive gear ratio. When the leg is trimmed in to plane the hull, the torque steer from this large-diameter prop is enormous as it tries to wrench your arm off. With this engine, only when the trim is neutral or slightly out does the torque steer disappear. Even Yamaha’s Enduro 60, with its 2.33:1 gear ratio, has this problem, so Yamaha sensibly offers only the small gear ratio F60C in tiller-steer versions. The 2.33:1 ratio FT60D is available only in remote control versions, where the prop steer torque is countered by the mechanical wheel steering. The demo F60C was perfectly matched to my hefty plate-sided test hull – a Blue Fin Trooper 475 style tinnie spinning a 13in pitch alloy prop. As with every F60C I’ve tested before, the demo engine started instantly hot or cold, didn’t blow oil smoke at any time and had the smooth idling that only the in-line four-cylinder four-strokes in this power range can provide. With the leg trim out just to the point of prop blowout, the WOT averages were 27.0kts (50.1km/h) and 5650rpm using 19.2L/h, where the engine was so quiet we could conduct a normal conversation. Powerhead access on the F60C is very good, with the canister oil filter and spark plugs easily reached. Although it has a belt-driven camshaft, the belt has a designed lifespan of 1000 running hours. The engine is a non-interference type so the valves won’t contact the piston crowns if the belt breaks. 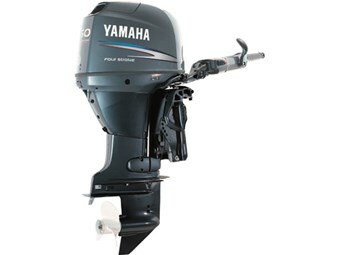 Yamaha has done an excellent job of providing anglers with a fuel efficient, quiet and user-friendly 60 that in my opinion is the logical low-emission choice for tinnies to 4.8m. The warranty coverage for recreational usage is four years.